We are now more than halfway through our 4-year project to transform the Dandenong Creek corridor into a world-class urban Living Link – and the results are starting to show! Together with our five partner councils (Maroondah, Knox, Monash, Greater Dandenong and Casey) and Parks Victoria, we have so far commenced work at 29 of the 38 sites that will be completed by the middle of 2020 (when the project finishes). In the second half of 2018 (Jul-Dec), these works included included 60.3 hectares of weed control and 6.3 hectares of revegetation to fill ‘gaps’ in the corridor, and 150m of fencing to protect sensitive areas. These activities will improve habitat for wildlife in this important corridor, as well as making it a more beautiful place for people to enjoy. The project also has a strong community focus, with 17 public events that engaged 466 people between Jul-Dec 2018. 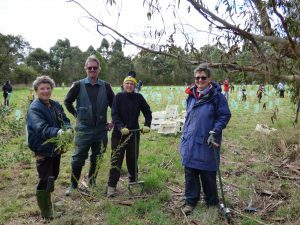 These included two large National Tree Day plantings, four bird discovery walks (in partnership with Birdlife Australia), an Indigenous bush tucker walk and an information night about the Frog Census program (including presentation of results from 2017/18). The two Deakin University Masters students completed their social research projects to better understand the barriers and benefits of connecting with nature in the Dandenong Creek catchment. One of the students then surveyed 78 community members using the Dandenong Creek corridor during December; a report compiling the results of these is expected early in 2019. Lyndale Greens Primary School (sponsored through this project) completed their Kids Teaching Kids program, which culminated in a conference held in Melbourne in October. The students presented their workshop “Foaming Mad” to other school children, highlighting the disturbing Dandenong Creek ‘foaming’ events.